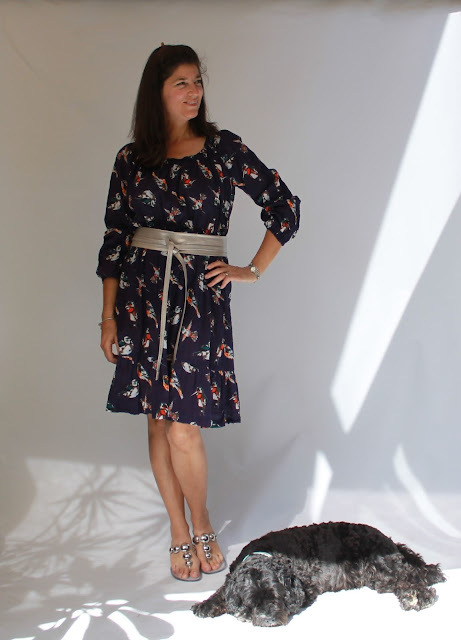 I was very excited to be a pattern tester for this dress as it is quite different from my usual style. I usually tend towards casual shift dresses and shirt dresses, so this fun and frilly frock was quite a departure from that. This is the Marie Gathered Midi Dress from the Named SS16 Royals Collection. You may be thinking that my dress is looking rather less than midi length and you would be correct. I initially made it longer, but decided I preferred it above the knee. I shortened it at the waistline so I didn't have to redo the frill. There is a picture of the original dress further on. This pattern has some lovely design features. 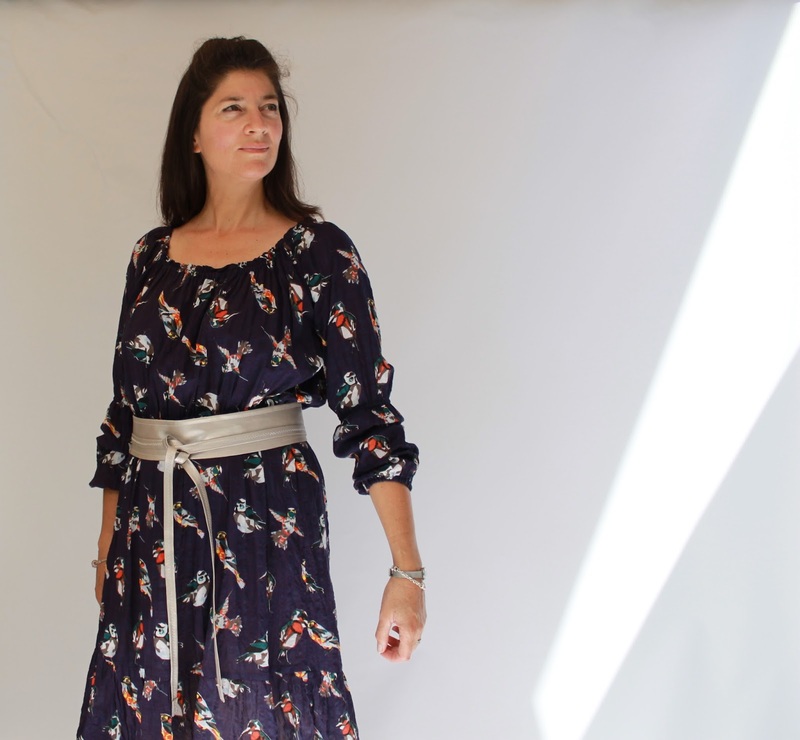 The neckline and waist are elasticated and there are lines of elastic at the elbows and cuffs. Then there's the frill at the hemline. This is such a comfortable dress to wear as it's all stretchy and the sleeves can be worn pushed up or down. You could even wear it off the shoulder if you were so inclined. 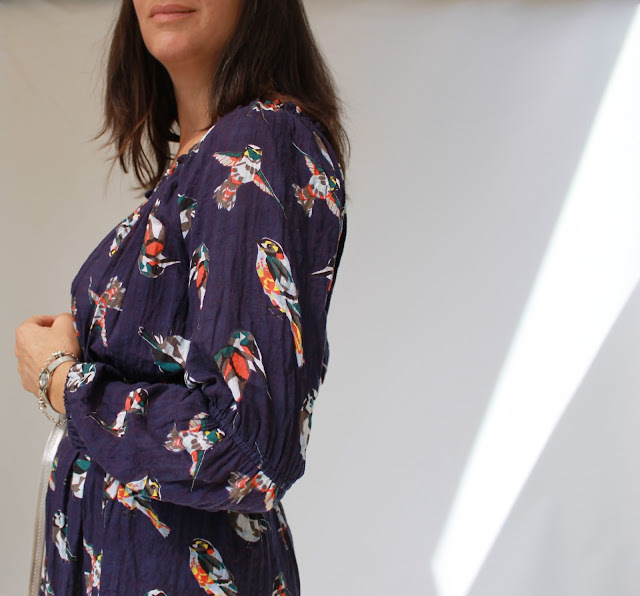 I used a light cotton fabric with a cute bird print from Textile Traders to make this dress. I was careful choosing the print as I didn't want it to be too large and overwhelming as there's a fair bit of fabric in the dress. Having said that, I had no trouble cutting the dress from 2.5m of 150cm wide fabric. The fabric hangs well and is lovely to wear. The belt is an obi-style one that I made from silver faux leather. Here is the dress before I shortened it and without a belt. I took the side seams in a bit on the final, shortened version too. So there we are, a gathered and shortened midi dress. And the verdict on the style? I really like it. It's so easy to wear and I keep reaching for it when I'm going out for lunch or dinner. I've worn it several times already. So get on over and check out the lovely patterns of the new SS16 Named collection. 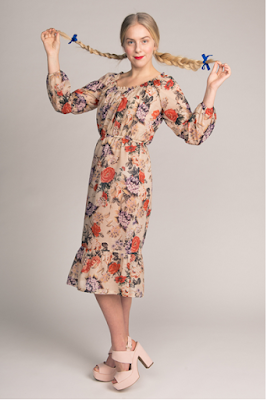 I've got my eye on the Beatrix dress and Eleonora skirt. I've also made the Marie dress as a blouse. Stay tuned! Again, a departure from your usual but very successful. 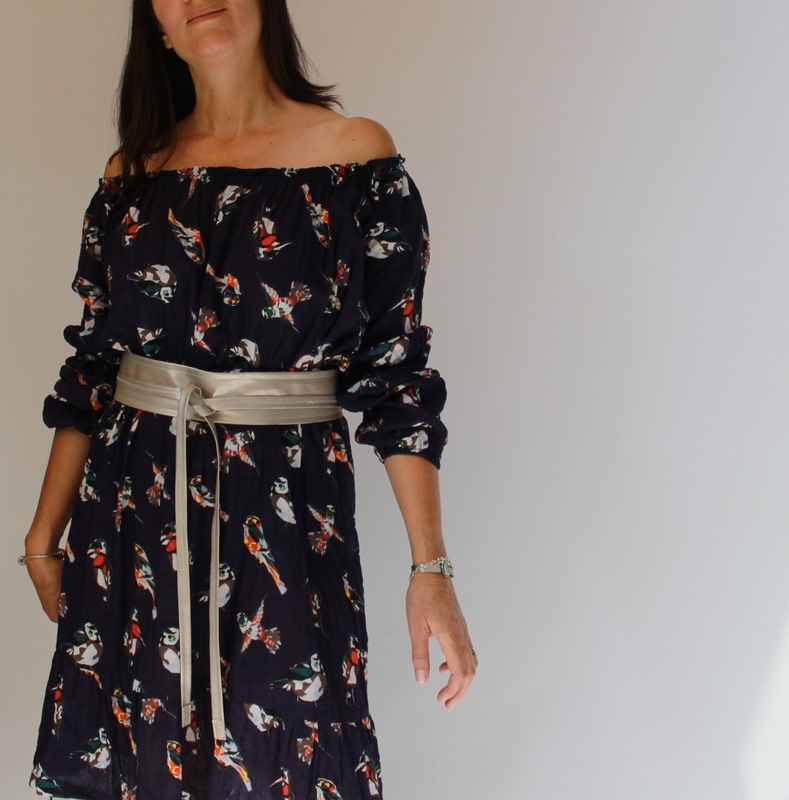 It's a great print with lovely colours and I love the silver belt: perfect! Thank you Marianna. I was so happy when I found that fabric! The shortened dress and silver belt really give this a lift. It does look really comfortable and chic at the same time. Thank you Carolyn. I do love the birds! I thought the last blouse was lovely, and this dress is too. 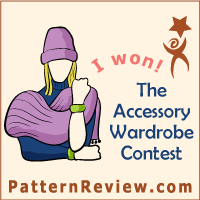 I'm in love with the gorgeous print you used, and think the strapless silhouette looks great on you! Oh, that's interesting. I wasn't at all sure about going strapless! I will reconsider. Thank you! A very pretty dress. I love the off the shoulder look. Very pretty dress and I love it worn off the shoulder too. Your changes to the length worked beautifully. I really like this too. Its a matter of personal preference, but like this style worn longer.